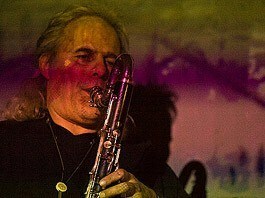 JOPO altosax, bassclarinet, voice, composition, began to play the bass-guitar in various blues, jazz and rock bands. At the age of 19 he started to learn the altosax, which has become his main instrument (learning by Ch. Baader, Swiss Jazz School A.Scherrer) and later the bassclarinet (since 1981), playing jazz on both of these instruments. Since 1975 he's been playing with extraordinary formations and projects, always as a leader or at least with own compositions. He has given concerts with David Moss, Mani Neumeier, Peter Warren, Doug Hammond, John King and others. He creates compositions of contemporary music as well as jazz, ethno, vocal-music and instrumental music, he composes for solo, small formations up to orchestra, musical-scenically and multi-media works, sound-concepts/installations, theatre- and film-music, performances and mini-musicals. The full list can be seen here on www.POFFETmusic.ch. The german AUGEMUS Musikverlag has published the sheets of the program Indian Book von JOPO und Ingeborg Poffet. He hast played as soloist at the Klangkörper Schweiz Expo2000 Hannover, as special guest for the Eric-Dolphy-Projekt of the Forchestra Freiburg and for the Peter Kleindienst Trio, as well as filmmusic and studiorecordings by D. Dettwiler/R. Schneider. Since 1983 he teaches saxophone, leads workshops and since 2000 he is leading the "House-Orchestra” together with Roberto dos Santos at the Musikwerkstatt Basel, where he is responsible for growing up and business as associate. He is busy in different cultural-political activities such as president of XOPF-Verein X.I.E.A.M.S. (Label XOPF-Records), organisation und partizipation of the int. XOPF-festivals Basel, delegate of the single-members Swissperform, 1995-97 president and member of the executive board MKS (MusikerInnen Kooperative Schweiz, nowadays SMS - Swiss Music Syndicate). He has won different prices (Kunstkredit Basel, Alexander-Clavel-Stiftung, composer-competition Syntharp 2010/2011). He has released numerous projects like CDs, DVDs, sheets and booklets. With his wife Ingeborg Poffet (accordion, voice, composition) he has founded the group Duo fatale in 1989. In their exciting formation they have achieved a symbiosis of composition, interpretation and improvisation. Based in Basel, Switzerland, they both compose the music for all their groups and for command works such as theatre-or filmmusic or multi-media performances. They have frequently worked together with local musicians on their tours across the world. Tours in USA, Europe, Asia and Africa with participations at int. festivals. With Duo fatale meets international guests the formation meets local musicians from the Avantgarde, Ethno, Classic, Jazz or Rock all over the world. They did many int. radio- and tv-productions (Izmir-Turkey, Bologna-Italy, SWF-Germany, DRS-Switzerland, Moscow-Russia, Sevilla-Spane, Bandung-Indonesia, Jazz Swissmade, Bremerhaven, Odessa-Ukraine and others).